Barry Dennen played Pontius Pilate in the original stage and film versions of Jesus Christ Superstar and earlier played a key role in Barbra Streisand’s emergence from cabaret unknown to a superstar. He died this morning in Burbank at the age of 79, according to Deadline Hollywood. It was terrific fun to see stage veteran Barry Dennen in the role of “The Old Actor” named Henry in the Reprise Theatre Company’s new production of The Fantasticks. We spoke a few weeks before opening night and he was excited but a little nervous about his return to the stage after a decade-long hiatus. The role in The Fantasticks marks Dennen’s return to LA theater after a long hiatus. He previously was in a production of She Loves Me at The Ahmanson and in Ghetto at the Mark Taper Forum. While he’s been away from the stage, he hasn’t stopped performing as he is in heavy demand for voiceover work for computer games. It’s a far cry from the days when he and Judi Dench had a lengthy run on London’s West End in Carbaret. He had the role of the Emcee while Dench, of course, was Sally Bowles. Dennen ended up living in London from 1968 until 1982 and during that time, had his most famous role of Pontius Pilate in the original concept album, original Broadway production and film version of Jesus Christ Superstar (pictured, left and below from his official website) His other film credits include roles in Trading Places, The Shining, Kentucky Fried Movie, Superman III, Dark Crystal, Fiddler on the Roof, and Titanic. While I loved talking to Barry about Judi Dench and talking about his most famous roles, what I really wanted to talk about was Barry’s relationship with Barbra Streisand! He lived with her in the early 60s just before she became a superstar and created and directed the nightclub act that helped launch her. He knew from the beginning that even if Streisand was not a conventional beauty, she was a singular talent. A fabulous singer yes, but a superstar? 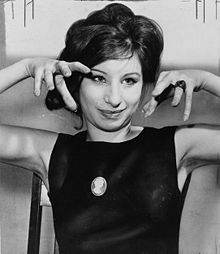 Still, the famously private Streisand is well-known for wanting to control her public image and could not have been thrilled with Dennen writing a book more than 30 years after their relationship ended. I asked him about her reaction. Streisand gave him a bit of the third-degree, Dennen remembered. Did he ever find out what Streisand thought of the book about their time together? But Streisand was not the last woman in his life and Dennen went on to marry a woman before finally living as a gay man in the early 80s. After his marriage ended in 1981, he met a man who he was with until 2001 when the man died of lung cancer. These days, Dennen is happy and single and open to new possibilities. I met Barry several years ago at the Chiller show in NJ, and then saw him several more times at the meet-and-greets at Jesus Christ Superstar screenings. He was a lovely person! So sweet, and wickedly funny! He will be sorely missed.